This is a simple 3band graphic equalizer for audio amplifiers. There are three controls for three ranges, low frequency,mid frequency,and high; or simply for Bass, Treble and Mid range. 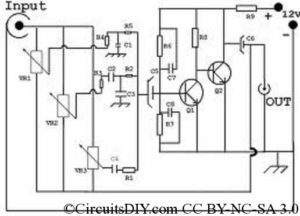 This circuit consists of a mini amplifier made by two BC548 transistors and the input-output differential feedback network is coupled with those controls as input. Though this unit has own amplifier unit, it doesn’t omits the need of preamplifier(if any). Only one channel is shown, if you need to use in stereo, add another clone. 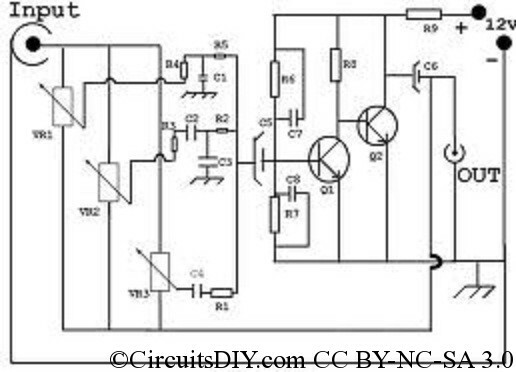 Hiii ,i also love electronics,but i don’t find the best ckt diagram,i have one apm (ic-LA5408) & i want to make a bass & treble ckt for it.help me easly. Unfortunately no, it was a very old project.